Claude Monet (CLAWD maw NEH) was born in Paris, France. Even as a young teenager it became apparent that he had artistic ability. He would draw caricatures of his teachers on his schoolwork. A caricature is a drawing that represents the person, but certain features will be exaggerated, or made larger than they actually are. He began to charge people to draw their caricatures and was able to have a steady income and even save some money. He served two years in the military in Algeria on the continent of Africa, but he became ill with typhoid fever and was sent home to recover. Monet had a small houseboat made. He would go out in the houseboat and paint scenes he saw from that view. He enjoyed painting outdoors observing how the light would change as the day progressed. He painted some scenes over and over again, and each would be different from the others because it was painted at a different time of day when the sun was at a different position in the sky. 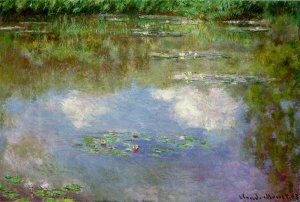 Monet was fascinated by light; the way it reflected off objects and the water in a pond. In his paintings he tried to capture this effect of light. 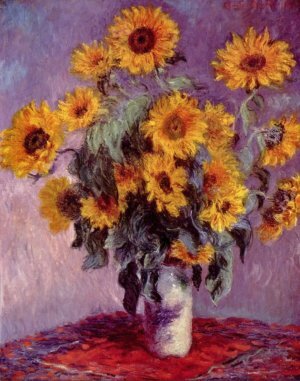 The Bouquet of Sunflowers was painted in 1881 and is a large painting, 39 by 32 inches. You can see it at The Metropolitan Museum of Art in New York. 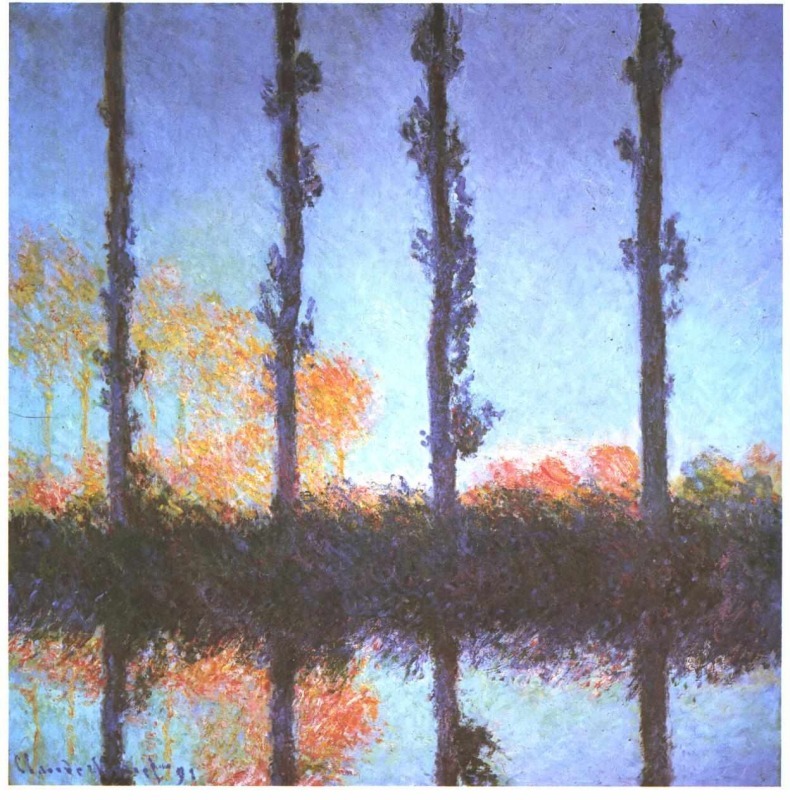 Monet made several paintings of Poplars. Each of them is quite different from the others in composition and color. 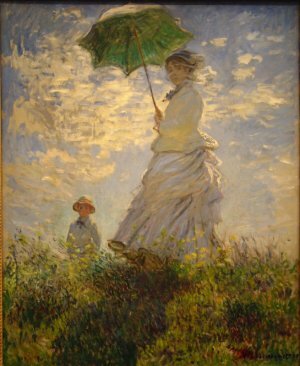 He also created more than one painting of the Woman with the Parasol. In some of them the woman is the main subject of the painting and in others she is secondary to the landscape. 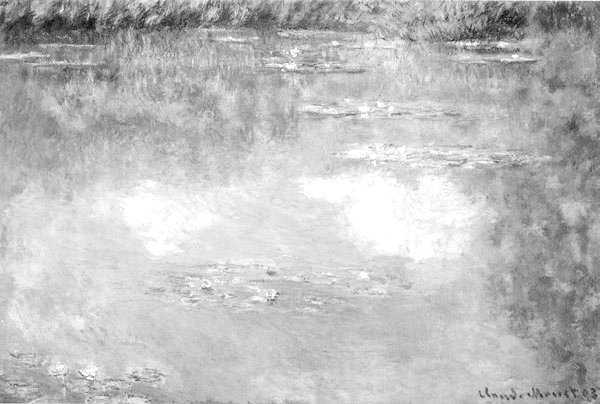 Monet and several other artists experimented with a method of putting paint on the canvas without blending the colors. He would get the paint directly from the tube without mixing it on his palette first. Brush strokes and dabs of color would be placed side by side. Monet called it the "division of colours". When you stepped back from the canvas, your eyes would blend the colors together. This was not the traditional method of painting, and many people rejected their works. In 1874 the artists decided to have their own art show at the studio of a photographer, G.F.T. Nadar who lived in Paris. More than 3,000 visitors came to the exhibit. The artists became known as "Impressionists" because Monet had titled one of his paintings " Impression - Sunrise ". Also some said the paintings looked unfinished and were just first "impressions". The artists who presented the show called themselves "Independents". He married and he and Camille had two sons. Unfortunately Camille died a year after their second son Michael was born. In 1872 he made a painting of his wife reading a book. 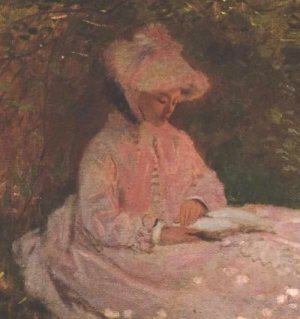 The painting is titled The Reader and is sometimes called Springtime. The light filtering through the trees looks like white flowers on her skirt. 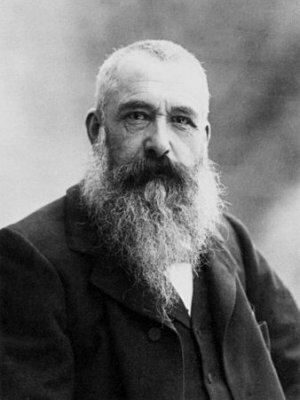 In 1883 Monet rented a house in Giverny, a village outside Paris. Several years later he bought the house and made his famous garden with the pond and Japanese bridge which are featured in more than 200 of his paintings. The latter part of his life was devoted to paintings made in his water garden. Toward the end of his life his eyesight became poor, but he continued to paint until his death. 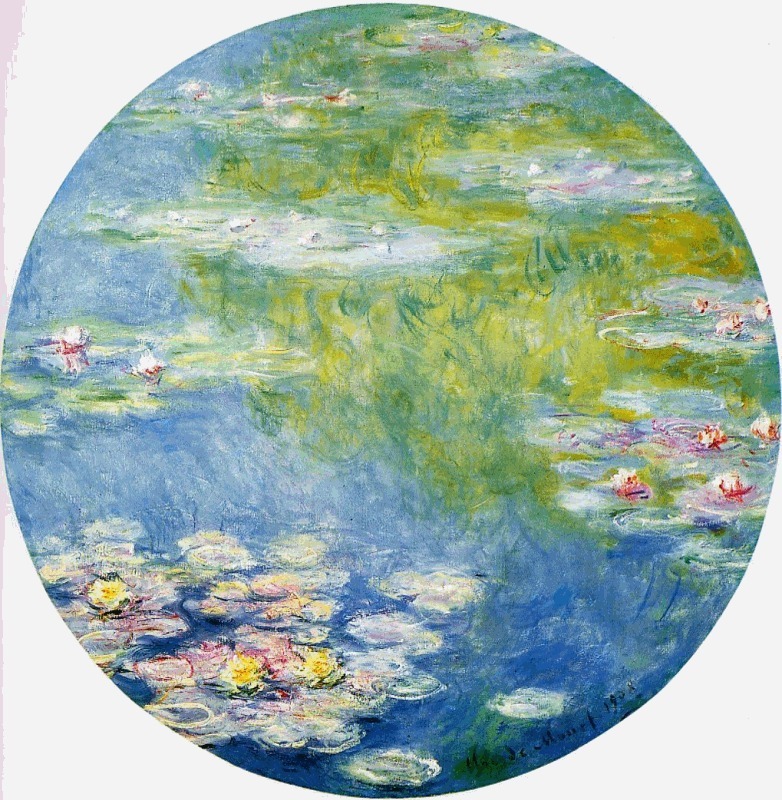 In fact, when he died, he was working on a huge water lily painting that today hangs unfinished in the Orangerie of the Tuileries (tweel REE) Gardens in France. 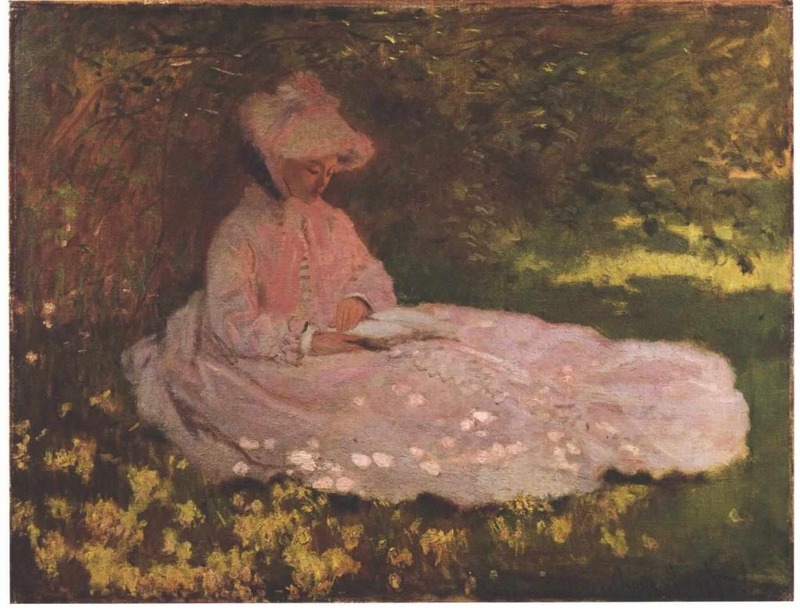 Press "Go" to search for books about Impressionists. This is an absolutely wonderful resource for homeschoolers!! Thank you! This page displayed 203,501 times.